Feel better now with free self help articles and audio advice from Mark Tyrrell of Uncommon Knowledge. Self help that makes you feel better now. When you read a self help article, you actually want to feel better, right? 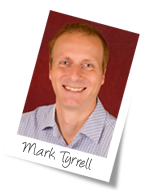 Mark Tyrrell's uplifting free psychological self help articles and audio advice are carefully crafted to make a difference right now. The audio snippets embedded in many of Mark's online self help articles will help you actually experience the positive changes you are seeking, so your visit to Uncommon Help will be time well spent.